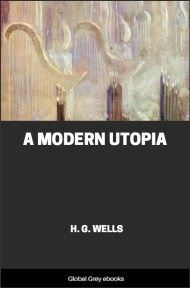 In his preface to this book, Wells forecast (incorrectly) that A Modern Utopia would be the last of a series of volumes on social problems that began in 1901 with Anticipations and included Mankind in the Making (1903). But unlike those non-fictional works, A Modern Utopia is presented as a tale told by a sketchily described character known only as the Owner of the Voice. In the book, two travelers fall into a space-warp and suddenly find themselves upon a Utopian Earth controlled by a single World Government.